Given that therapeutic endoscopy is often carried out in high risk patients, careful patient monitoring and modern resuscitation equipment are essential in order to address potentially life-threatening complications. Said complications, can take place not only during the course of treatment, but also during the immediate post-operative period. It is therefore imperative that both the endoscopy suite and the recovery room be equipped to deal with the potential complications of therapeutic endoscopic procedures. The three key elements of patient monitoring are telemetry, blood pressure monitoring, and pulseoxymetry. In the recovery room, basic equipment includes a defibrillator, ambubag, laryngoscope and endotracheal tubes for intubation, as well as a mechanical ventilator. 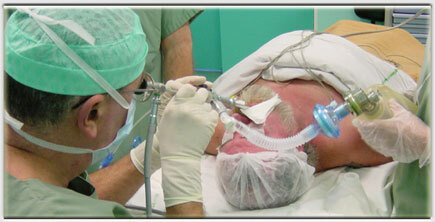 Our rigid bronchoscopic technique allows for intermittent spontaneous ventilation. 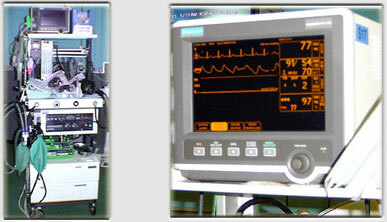 Monitoring oxygen saturation is therefore a constant preoccupation. The pulseoxymeter is essential. Hypoxemia, which is among the most feared complications of the procedure, may be due to violent coughing, alveolar hypoventilation caused by the anesthetic, bronchial obstruction, hemorrhage, the bronchoscope itself, or a combination of some or all of these factors. As a result, laser resection is usually intermittent ; the endoscopist must pause frequently in order to facilitate adequate ventilation and oxygenation of the patient. The simplest and most reliable means of detecting hypoxemia is oxygen saturation monitoring via the pulseoxymeter. This instrument measures precapillary oxygen saturation at the level of the ear lobe or finger. Pre-procedure oxygen saturation measured by pulseoxymetry is used by the endoscopist as the baseline reference during the course of the procedure. 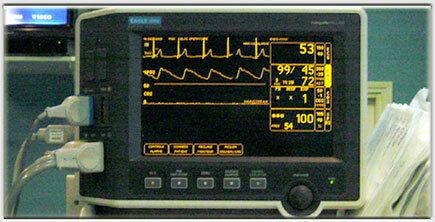 Oxyhemoglobin desaturation is detected by the instrument which alerts the endoscopy personnel with an audible alarm. Constant monitoring allows the endoscopist and anesthesiologist to detect impending hypoxemia thus preventing potentially life-threatening cardiovascular complications.